Delver of Secrets awakens a lot of pleasant memories of the Innistrad block, and of how surprising and inspiring a lot of its cards were. 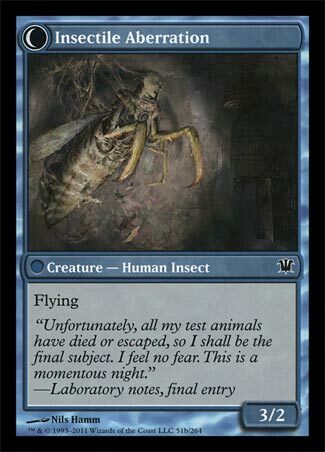 Back in the 90s, if you had told me there would one day be a card specifically inspired by The Fly, I most likely would have said you were crazy. If you had told me it would also be one of the best blue creatures of all time, I probably would have told you to get back in your DeLorean and get out of here. It’s not a conventional aggro creature in any way – it requires a high concentration of spells in your deck, and it’s not a creature-type tribal card like a lot of blue’s older aggro creatures, but that fact of working so well with spells makes it arguably the most quintessentially blue creature of all time. This week we are going to look at some of the more notable cards in “From the Vaults: Transform.” I went to the Innistrad pre-release eager to get my hands on some brand new double-faced cards. I was ready to rip into my opponents with my Green Red Werewolf deck. My excited cooled a bit after I fought 3 decks in a row that used this now infamous card. Looks like this week is Transform cards week, in honor of From the Vault: Transform. Seems a bit weird to do a From the Vault on a card type that’s been around for only six years (since Innistrad) and has only shown up in six sets so far, but I don’t make the decisions. 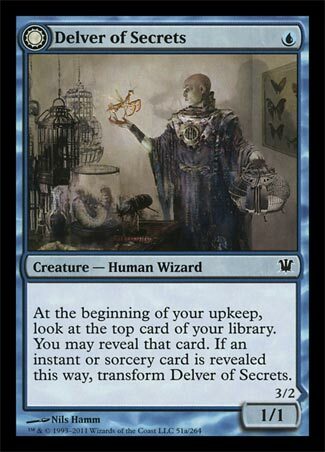 Delver of Secrets is probably the most notorious transform card from Innistrad, and it’s easily in contention for one of the most powerful commons ever printed. The flip condition is very easy to meet in a deck he’d slot into (usually some Izzet or Grixis shell), and your reward is a 3/2 with flying, oft on turn 2. Attacking with 3 power on turn 2, especially 3 evasive power, is very good, and he’s been a powerhouse in any constructed format he’s been a part of. He’s not a great card to put on turn 10 or so, once the board gets nice and congested, since he’s pretty useless until he flips, but he’s a formidable early powerhouse and a good part of why the infamous “Delver deck” is still a format-defining monstrosity.